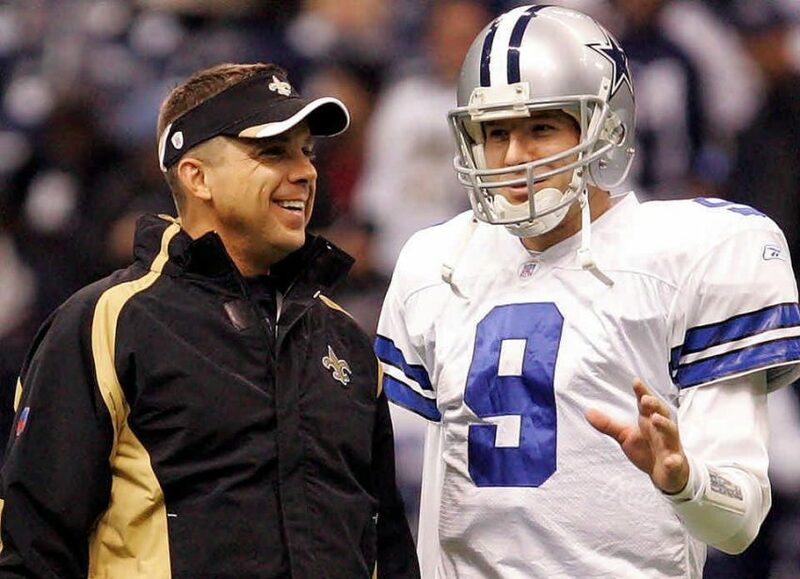 Eastern Illinois alums Sean Payton and Tony Romo have worked togather and against one another in the NFL. 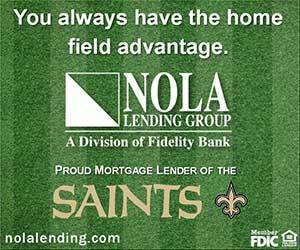 Three of the most well known of the more than 70,000 people inside the Mercedes-Benz Superdome this Sunday carry a unique bond. Sunday, their jobs and their attire will be notably different – one in black and gold coaches’ gear, another in a suit in the broadcast booth, the third in a white, blue and red game uniform. But once upon a time, they all dressed the same and had the same job – starting quarterback for the Panthers of Eastern Illinois University. Sean Payton, Tony Romo and Jimmy Garoppolo would certainly rank among the most famous alumni, not just former quarterbacks, in the history of EIU, a Football Championship Subdivision school in Charleston, Illinois, a town with a population less than one-third the capacity of the Dome. Former Eastern Illinois athletic director Barbara Burke, who is now deputy AD at the University of Iowa after a two-year stop as a senior administrator at Tulane, gives credit to the Panthers’ former head football coach. Payton, who played for Al Molde from 1983-86 and graduated the year before Spoo arrived, set school career records for completions (756), attempts (1,408), passing yards (10,655) and touchdowns (75). Romo wore the blue and grey of EIU from 1999-2002, breaking Payton’s record for career touchdowns with 85. 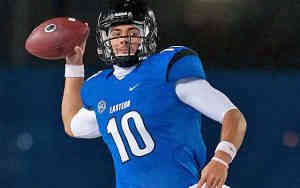 Jimmy Garoppolo was a four-year starter at quarterback for Eastern Illinois. Garoppolo would obliterate all of those career marks in his four years in Charleston (2010-13): 1,047 completions, 1,668 attempts, 13,156 yards and 118 touchdown passes. Payton does still hold a pair of notable single-game school records – 40 completions and 509 passing yards against Saginaw Valley in 1985 – and the EIU mark for career 300-yard games with 22, one more than Garoppolo. Romo and Payton are the only two players in program history to have their jerseys retired, though Garoppolo might just be next on that list. Romo’s No. 17 was retired in October 2009, during a bye week for the Cowboys. Payton’s No. 18 was retired in September 2010, seven months after he led the Saints to victory in Super Bowl XLIV and two days after New Orleans opened their Super Bowl defense with a Thursday night victory over the Minnesota Vikings – coached, coincidentally, by another Eastern Illinois grad, Brad Childress. Payton was touched by the honor. 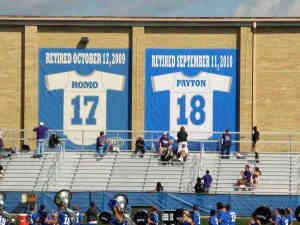 Retired jerseys of Tony Romo and Sean Payton hang side-by-side at O’Brien Stadium in Charleston, Ill.
Two Saturdays after Payton was in Charleston, Illinois, for his jersey retirement ceremony, Garoppolo – then a freshman – made his first start at quarterback. He would go on to make 45 career starts behind center for the Panthers. The EIU-to-the-NFL connections also include former NFL head coaches Mike Shanahan and Childress; former Saints player personnel director Ryan Pace, now the general manager of the Chicago Bears, and former Saints special teams coach Greg McMahon, now a consultant on Ed Orgeron’s staff at LSU. They and several other NFL connections are featured on the inside front cover of the Panthers’ football media guide. In February 2003, Payton was on Bill Parcells’ staff with the Dallas Cowboys when he met Romo for the first time in at the NFL Scouting Combine. Romo went undrafted and signed with the Cowboys as a free agent. Payton nearly had the chance to see Romo a lot more. Shortly after he got the Saints head coaching job in early 2006, the Saints and Cowboys discussed a trade for Romo. According to Parcells’ 2015 book, “Parcells: A Football Life,” the Saints offered a third-round pick for Romo, but the Cowboys wanted a second-round pick and the deal did not materialize. Romo became the Cowboys’ starter in 2006 and would start 127 games in Dallas, passing for more than 34,000 yards and 248 touchdowns and leading the Cowboys to four playoff appearances. When Romo retired after last season, he wasn’t unemployed for long, moving into the No. 1 broadcast booth for CBS alongside Jim Nantz. He made his debut Sunday for the Oakland-Tennessee game – largely receiving positive reviews for his efforts, particularly on his ability to predict the upcoming play. 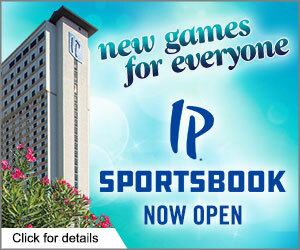 Week 2 of the NFL season takes the Nantz-Romo booth to New Orleans on Sunday. Interestingly, the two starting quarterbacks on the field on Sunday – Tom Brady and Drew Brees – each are older than the former quarterback who will be analyzing their play. Ideally, Garoppolo will spend all of Sunday watching from the sideline with a cap and headset on as Brady operates the Patriots offense. Just as Romo waited nearly four full years before getting his shot, Garoppolo’s time is coming – either as Brady’s replacement with the Patriots or with another team. “He is learning some valuable lessons that will one day allow him to be an impact player,” Burke said. While Payton coached – and later coached against – Romo, he and Garoppolo have never been on the same field for an NFL regular season game. The last time the Saints and Patriots faced off – 2013 in Foxboro – was Garoppolo’s senior year at Eastern Illinois. 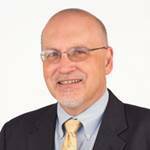 Add Romo in the broadcast booth, and the attention Eastern Illinois figures to receive on Sunday is immeasurable.